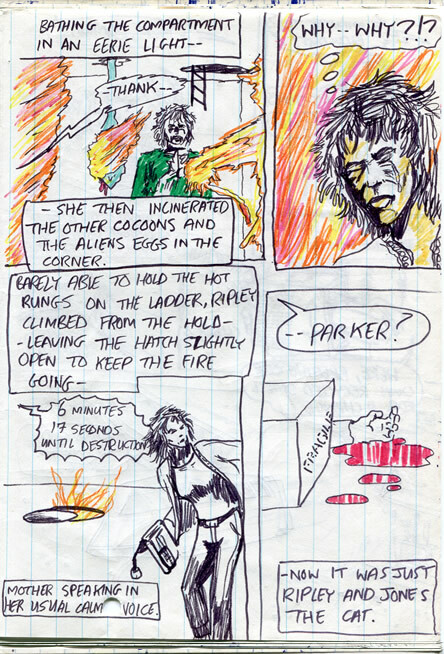 ALIEN age 11 - Comic/Graphic Novel and Blog: "Why -- why?!?" 1982? I can't think of much to say about today's page. At least there's a bit of colour! I suspect that this was done around 1982 or so. I was enjoying using a thin felt-tip or fibre-tip pen. More's the pity. It's funny, I saw a programme about 15 years ago in which Robert Crumb or someone was talking about drawing comics with a brush and I was amazed. It had never occurred to me that the varied thickness of line that great comic artists use so well was the result of brushwork. It's been recommended that I get a dip-pen and try it - because I think you can achieve something similar - but I haven't yet. It's hard to bring yourself to adopt a new method which makes it seem like you're learning all over again from scratch. The closest I got to that effect recently was by using an Indian Ink brush pen. I was dazzled with the result. I can see why you need to work BIG when using a brush and then reduce it all down for the final printing. When I was a kid, I once actually really looked at some Marvel artwork of the Hulk and noticed how the thickness varied around muscles etc. I laboriously went back over my uniform lines varying the thicknesses - with the same pen. Worst still was when I got a very fine Rotring pen and became enamoured with that anally-retentive, nerdy drawing tool. It just seemed terribly professional using such a grown-up instrument at the age of 15 or 16. As usual, as I start to think about doing something the right way - it turns out that it's become the old way. Most comics these days are - I think - drawn via a graphics tablet or directly onto the screen to computer. Photoshop gives a nice line that you can undo if you're not happy with it - and Illustrator will actually smooth your line as you go, making you look like a pro. You can even edit the variable widths and tapers afterwards! There are undos galore too so you don't have to make a big commitment to paper with every mark you make. Funnily enough, there's a new FLESH strip running in 2000ad comic at the moment which is done in a very scribbly style. The penmanship is virtually amateur looking much of the time but the composition and action make up for it. There's also a nervous, excited energy to it.